This residential part of Miramar Beach feels blissfully low-key. Sunscreen and water wings, and you're good to go. Grab all the fixings from your condo and head for the shady BBQ area. Forgot the dominoes? Any game will do. Chill in the air? The game room's ready and waiting. Kids will love the game room and kiddie pool! You're close to dining, golf and the Silver Sands Designer Outlet Mall. The resort’s seaside courtyard features a pool surrounded by palm gardens and spacious lawns extending out to the pristine beaches of the Emerald Coast. Nestled in a quiet residential neighborhood on both sides, you have access to a blissfully uncrowded stretch of Miramar Beach. You have two pools to choose from, plus a hot tub, sauna, and kiddie pool for your little splashers. Feast on family favorites in the shaded BBQ area. And head straight for the game room if rain interferes with your beach plans. If you’re into tennis, bring your racquet and game face and hit the lighted courts. Condo rentals at Mainsail Resort by Wyndham come with full kitchens, living rooms and dining areas, plus private balconies for escaping that kids’ movie you’ve seen 3,427 times already. You’re close to a local shopping area for CVS and “emergency” Chick-fil-A runs. - Front desk is open 9:00 AM-5:00 PM daily. 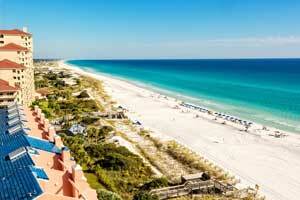 Check-in location is at ResortQuest Miramar Beach Office – 11125 US Highway 98 West, Miramar Beach, Florida. 32550. Guests that are planning to arrive outside of normal front desk hours must use the phone located by the front desk to receive a code to a lock box. For more information please contact the property using information on the booking confirmation.